Though 'D' shines more, i think 'B' is a bit more mysterious and the rose seems to flow in space. The green background in B is a compliment to the red in the flower, so it pops a bit more. 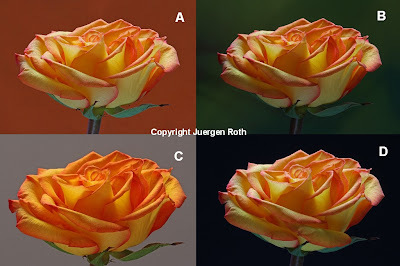 But I have always liked flowers on black so I'm going to go with D.
I looked at the 4 roses again and I am equally divided between B and D. Thanks for casting your choice Brad ... good luck at the raffle! When looking at them on your FAA blog I didn't like a or b. Now that I can see them a little larger here, I am leaning towards B. I like the rich colors the green background brings out in the rose. I have always liked black for the backdrop on flowers, but sometimes we have to step out of the box and try something different. Thanks for doing this...gets our creativity flowing! Interesting point Donna. Originally I liked A the best and that's the one I uploaded to Fine Art America first. I then added D because I am currently obsessed with photographing flowers over black but I also like B a lot. The green and orange goes very well together and I may upload this to Fine Art America as well. Thanks for commenting here on my photo blog ... very much appreciated! B - Beautiful, floating, and a perfect flower. Thanks so much for commenting on my rose flower photography Shari ... glad you like B the best. It will be interesting to see which one people like the best ... good luck at the free art give away next Monday on Earth Day! I really like the ones with high contrast. I think in C and D the flower stands out more.. in A and B they are almost blending into the background. I am also in general biased towards black, so if I had to pick one I would take D but just by a hair over C.
I love the drama of D, but the orange background of A emphasizes the softness and fragility of this beautiful rose. I would love to hang this is my home. B. Looks like more in its natural setting. The colors are rich and the highlights stand out more. Beautiful work! This give away is now closed and I am going to draw a lucky winner tonight ... may be two because of the great response and if you all vote for my image >>> http://fineartamerica.com/contests/national-tv-photo-contest.html?tab=vote&artworkid=534365 <<< I know most of you already did but every vote counts ... thanks and good luck at the draw!